SAVE SOME GREEN APRIL DEALS! 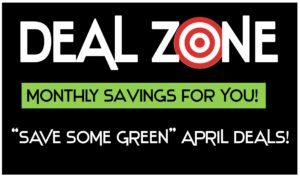 You’ll find fresh April savings on our Deal ZONE this month. It’s your chance to save some green on everything from BLACK STALLION Fire-Resistant, Cotton-Stretch Back Jackets to MCR Lens Cleaning Wipes to a HOUGEN Rotacut Kit Sheet Metal Hole Cutter.